The Black Sea bass is a member of the grouper family, smaller than it's cousins found is Asia and Australia, it is found on the Eastern seaboard between, Maine, Florida and the Gulf of Mexico normal catch weights are between 7 and 8 pounds at a length of 20 inches. This year 2010 the fishing season has been extended from the usual September to the end of December due to the protection measures taken over the last few years following much over fishing. Reproduction takes place between May and June with tiny eggs that only take one and a half days to hatch. The white Sea bass is a member of the Croaker family and makes a very distinctive noise underwater, usually found off the pacific coasts. White sea bass travel in schools feeding on small fish usually sardines, in shallow waters. Usual catch weight is about 7 pounds and 28 inches long. Some rare fish have been caught that have been over five feet in length and weighing over 90 pounds. In Europe there is the European Sea bass which can grow to a meter in length and weigh over 15 kg. Normal catch weight is between and 2 and 4 kg. European Sea bass are very slow growing taking many years to reach full maturity, a 20 year old bass typically weighs around 5 kg with a length of 70 cm. Over the last twenty years the number of Bass in UK waters has decreased, due to them becoming a commercially valued fish following them being used in recipes by top chefs and cooks. They are now starting to make a comeback but are generally of a smaller size than fish of yesteryear. When Sea bass fishing you can be sure of a sporting challenge as Sea Bass are well known for their fighting prowess and put up a lively fight when hooked, light tackle can increase the thrill further. They can be caught in a variety of ways ranging from using lures that look like small or injured prey fish to more regular baits such as worm or crab, live baiting especially for White Sea bass can be very productive. The majority of fishing in the US is done by boat using a variety of tackle but in the UK many fish can be caught from the shore, with specialist tackle available for the keen angler. 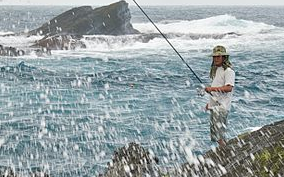 A technique that many fishermen prefer when fishing from shore is to use very light tackle, just a rod, fixed spool reel and a couple of lures and employing catch and release for any fish caught a very enjoyable day can be had. The term "Bass" actually refers to several different species of game fish. It includes both marine and freshwater species. There are black basses like the largemouth bass, smallmouth bass, spotted bass and the Guadalupe bass. There are also temperate basses such as the white bass and the striped bass. There are many other species of bass such as the black sea bass, giant sea bass, Australian bass, Chilean sea bass (more popularly known as Patagonian toothfish) and the European sea bass. The body temperature and metabolism of bass are controlled by the water temperature. Bass are most active when water temperature is between 60 and 75 degrees. If the temperature drops below 50 degrees, their metabolism slows down. The diet of bass varies. They eat minnows, crawfish and sculpin. They also eat crippled or injured prey such as mice, rats, ducklings, worms, snakes, salamanders, lizards, etc. Bass fishing is a sport that involves angling specifically for black bass. It actually started in the late 18th century. The earliest record of bass fishing becoming a sport would be 1769. Onesimus Ustonson introduced his multiplying reels to fishing enthusiasts. Later on these reels evolved to become bait caster. More than a century later, in 1897, William Shakespeare, Jr. was granted a patent for a level wind device for fishing. In 1915, the Shannon Twin Spinner was produced by the William J. Jamison Company. It was an excellent reel. This led to the creation of the modern spinner bait reels. In 1932, several dams were built for generating hydroelectric power. This resulted to the creation of several lakes. These lakes were later used to culture many varieties of bass fish. When the DuPont Company created a new type of fishing net made of nylon in 1937, fishing experts realized that it was the perfect material for a monofilament fishing line. This caused bass fishing to continue to grow as a sport. The 1950's is considered to be a very successful decade as far as this sport was concerned. Most of the modern bass fishing equipment was created at this time. This included bass boats, lines, lures, rods and other types of fishing gear. Fly fishing for smallmouth bass has once again become popular since the early 1990s. This technique uses fly patterns, rods and fly lines that are suited for bass. When Larry Nixon won one million dollars for bass fishing in 1992, the sport's popularity was renewed. Perhaps what has made the sport very popular for a long time is that in 1932, George Perry was said to have caught a 22 pound, 4 ounce bass in Montgomery Lake, Georgia. This feat was duplicated by Manabu Kurita of Aichi, Japan who caught a 22 pound 4 ounce largemouth bass on July 2, 2009. If you catch bass in one place, chances are, you will catch more in the same area. Bass usually travel in schools. When the water is deep, schools of bass tend to be closer together. This makes it easier to catch more fish. Just remember that all black bass are known to be strong fighters. Another thing that you should remember is that, the closer bass are to the bottom, the more they are likely to feed. Bass are predators who eat live prey. Instead of hunting however, they lie in wait for their victim. This is where your casting accuracy will come in handy to ensure your success in bass fishing. From late winter to spring, bass can be found near or within spawning areas. These are usually flat, shallow areas with a little cover and quick access to deep water. Everything that the bass are doing throughout the year is connected to spawning. Bass fishing has evolved into a multi-billion dollar industry. The black bass has become the second most sought after game fish in the United States. More fishing equipment has been developed for this sport. Today, bass fishing contributes fifty to seventy billion dollars every year, to the US economy and these figures will continue to grow. In fact, studies have shown that more people are becoming interested in bass fishing compared to the number of people who are interested in sports like tennis and golf. Just as with any other type of fishing, deep sea saltwater fishing techniques are largely dependent on what specifically you are trying to catch. However, the good news is that there are particular tips and techniques that can help you have a better chance of landing your fish of choice while you're out on your deep sea expedition. Though there are a host of targets for deep sea fishermen, a few of the common ones are the albacore, yellowtail, white sea bass, and barracuda. Each one of these requires a specific knowledge and approach to make your deep sea expedition a success. The albacore tuna can be found in temperate deep seas across the globe. It is distinguished from other tunas by the elongated pectoral fins. The albacore eats primarily small fish, but squid crab and shrimp play an important part as well. When you set out to go deep sea fishing, keep in mind that they are located and caught most often by trolling through an area that offers prime diet and temperature conditions for the fish. Most often, the environment in the waters off of California and Mexico present an ideal place for the albacore. As a result, most albacore deep sea fishing success comes when they are sought after in those waters. Most deep sea sport fishing boats supply trolling rigs for albacore, but if you prefer to use your own rod, you need to make sure that it is between five and a half to six and a half feet long with a sixty to eighty pound test. The majority of troll caught albacore are caught on feather jigs with colors depending on the condition. If you decide to use bait when fishing for albacore, the most effective kinds are anchovies or sardines. One of the key things to remember when deep sea fishing is to always be alert and prepared - from the very first cast on. It is often the first baits into the water that are bit. Also, when your boat has stopped, make sure that your line is straight out in front of you - this will prevent tangles. Another popular target of deep sea fishermen is the yellowtail. Typically found in more tropical waters, there are a number of ways to fish yellowtail. They will take a variety of baits and lures, with squid, sardines, mackerels, and anchovies being the most preferred. One thing to keep in mind when dealing with yellowtail is that they are extremely fast. You will most likely want to use a kind of jig fishing, which allows you to fish with much heavier line. A thirty to fifty pound test works pretty well. However, when the yellowtail are feeding on or near the surface, they sometimes will take surface iron. Squid is certainly the most effective bait of all when dealing with yellowtail. The specific type of hook and jig that will work best is most accurately determined by certain conditions - such as current, depth, and the typical size of yellowtail in the area.